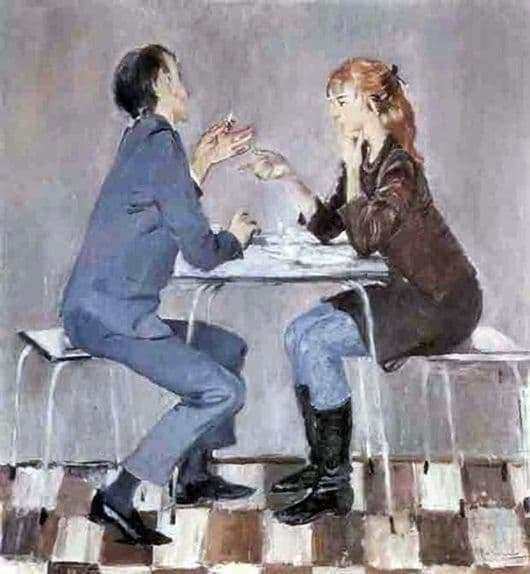 The painting “Dispute” belongs to the brush of the Soviet artist Yuri Pimenov. In his works, the artist tried to reflect the reality of the present. The picture is extremely easy to read. At the same time, she is endowed with a certain charm and lyrical notes. The canvas was created in 1968. The artist depicted on the canvas a couple of young people. Supposedly, the guy and the girl are in the dining room. It may even be a lunch break. Pimenov more than accurately conveyed the Soviet look to the canvas. The picture shows the tables and plates, typical for this epoch, the simplest chairs and absolutely bare walls, which are painted with strange gray paint. The floor is tiled. In a place with this, the atmosphere radiates immediate purity and light. Based on the name of the picture, the people depicted are arguing about something. The viewer can only guess who they are. Perhaps it is schoolchildren or students who went into the dining room to chat and have a snack. They are simple non defiant clothes. At first glance, it is noticeable that the girl and the guy are intelligent, well brought up. This is indicated by their gestures, permeated with mutual respect. The young man is wearing a modest suit. And the girl is dressed in a brown skirt and the same jacket. Visitors to the dining room have a lively discussion. That’s just what topic, it remains only to suffer speculation. The guy is trying to convince the girl of something. Apparently he leads a strong case. She became thoughtful. It seems that the girl is about to agree with his opinion. The artist painted on canvas young people from the 60s. The relationship between boyfriend and girlfriend is not hostile, but rather friendly. They are both interested in the subject matter of the dispute. They have a common interest. This is noticeable in their postures and gestures. Although the face of a young man is not visible, she is visibly interested in a girl. They are united by their common cause.